The inside is hand engraved, "Hilda." It's a lovely ring, approx a 6 in size. The best I can tell is that it's never been resized. 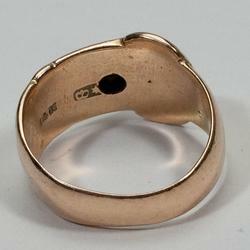 The ring has a buckle style motif.